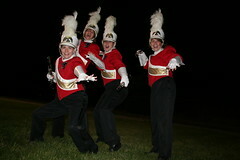 Yeah...I almost forgot to tell you all that pictures from Homecoming '08 have been posted on the official picture page. Pics from Saturday's contest will be going up later tonight. I've been pretty busy this week with props and fifth grade band, so it took me a while to get to them. Thanks to Ms. Janchar and Mr. Jerew for helping me take pictures at this weekend's events! I just love the Ninja clarinets!